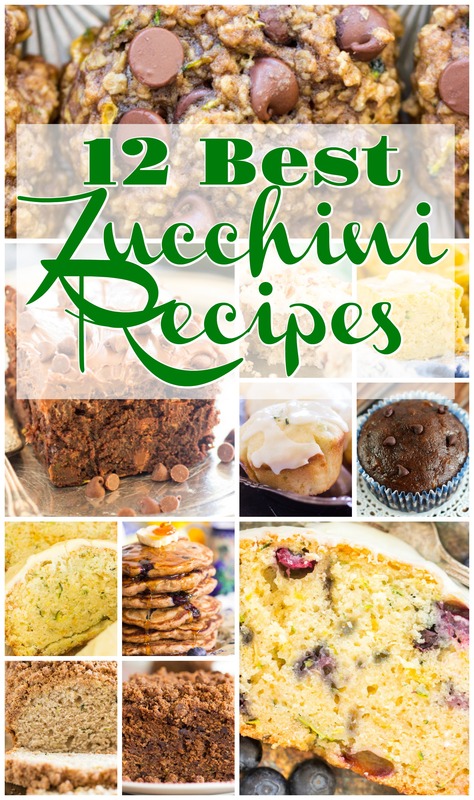 I have a lot of zucchini recipes on my to-do list, but I’ve also got a lot of zucchini recipes on the blog as it stands! I thought I’d gather them together in one place for you. 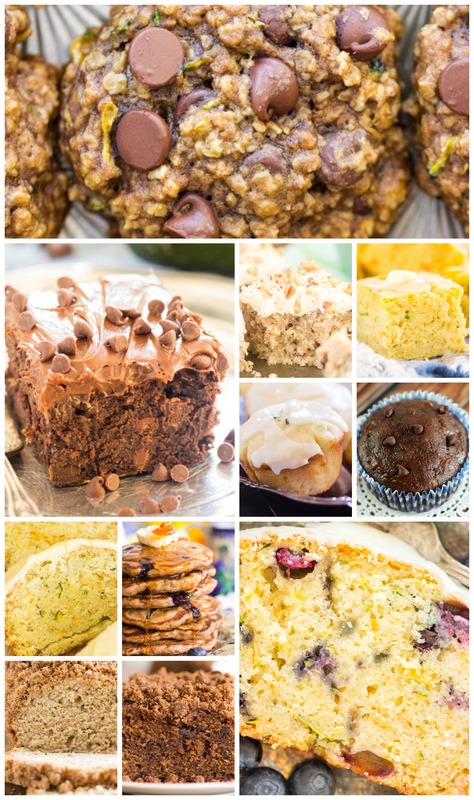 Most of these are breakfast and brunch recipes – like zucchini muffins, zucchini scones, and zucchini breads, but I’ve also got a few desserts. You’d be surprised how delicious a green veggie can be in a cookie or brownie. In addition, a handful of savory zucchini recipes. I’ve mentioned this in the past, but zucchini has become one of my favorite ingredients to bake with. As pumpkin is to the fall season, zucchini is to spring and summer. Don’t you think? Let’s start with zucchini recipes for breakfast or brunch. 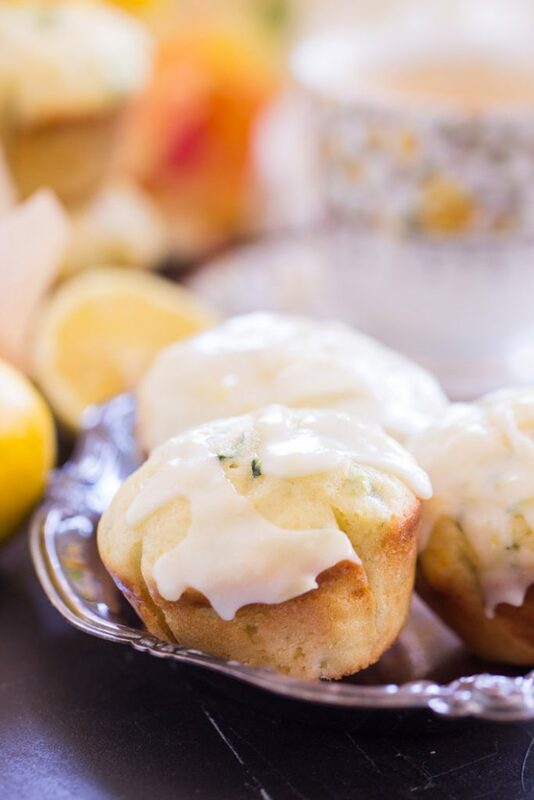 Lemon Zucchini Muffins with Lemon Glaze: What I love about these zucchini muffins is that they’re very light and fluffy. This is an airy muffin, not dense or bread-y. Almost cake-like, but these aren’t too sweet. The glaze does send them into sweet territory, but not too much! Chocolate Zucchini Muffins: These zucchini muffins are more into the realm of bread-like. 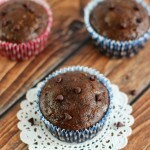 Denser and sturdier muffins, but chock-full of cocoa and chocolate chips. Again, not too sweet for breakfast – these aren’t dessert-y – but on the sweeter side, for sure. 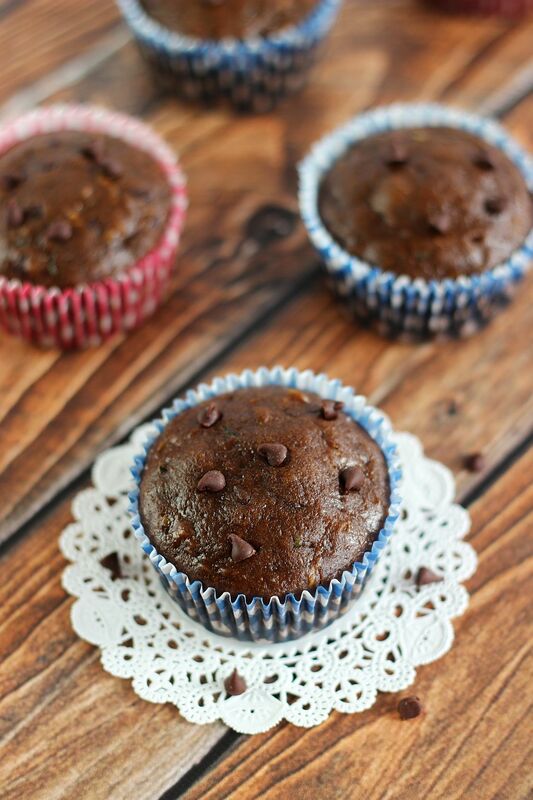 Mini chocolate chips really rule in these because they add little nuggets of chocolate everrrrrywhere! 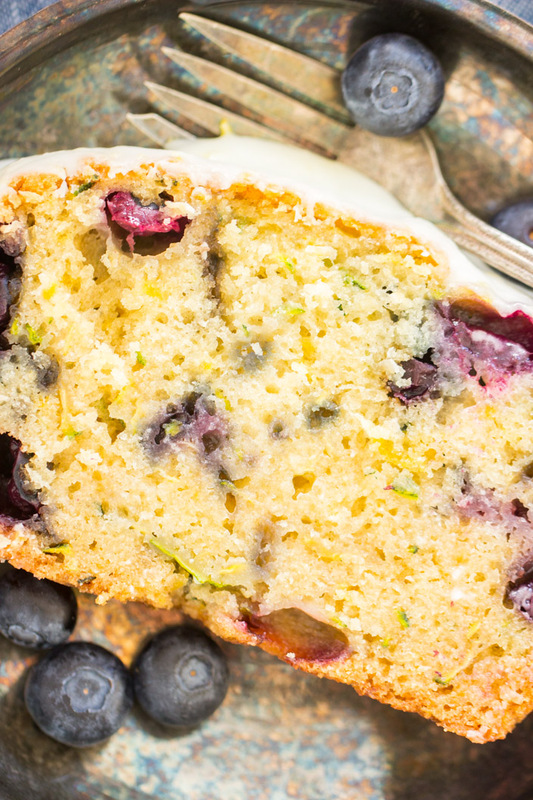 Lemon Blueberry Zucchini Bread with Lemon Glaze: This zucchini bread is adapted from an old family recipe for Chocolate Zucchini Bread. It was so easy to leave out any cocoa, and to add in blueberries and fresh lemon zest. So easy to makeover that classic zucchini bread recipe with a fresh, springy twist. Orange Zucchini Bread with Orange Glaze: Same! As with the Lemon Blueberry Zucchini Bread, it was easy to makeover the old family recipe with an orange spin. By the way, zesting can be a little big of a drag, and so I 100% recommend this zester/juicer for ease and time-saving. A good zester is a game-changer in the kitchen… I’m embarrassed by how long I waited to purchase one. Zucchini Banana Bread with Streusel Topping: My all-time favorite banana bread recipe – one that I’ve used for almost 15 years now after trying dozens. 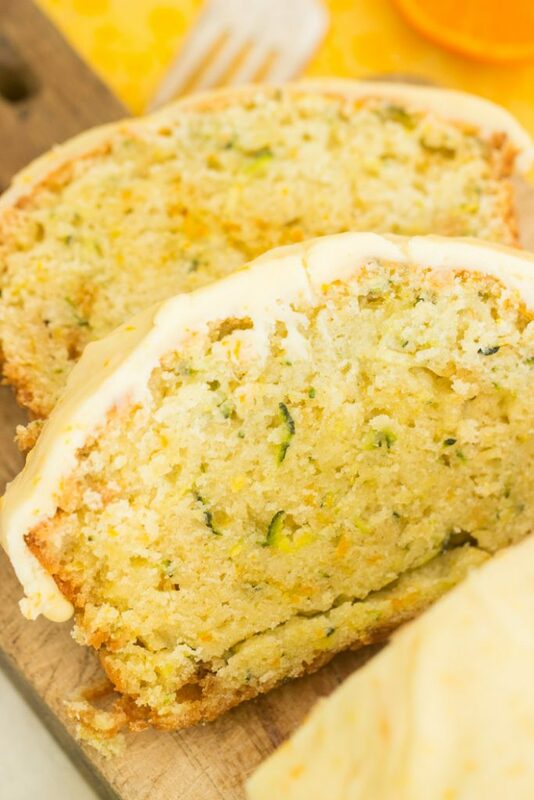 It’s soooo full of banana, and super moist as it is, but adding zucchini gave it an extra boost of intense moisture and a touch of additional sweetness. 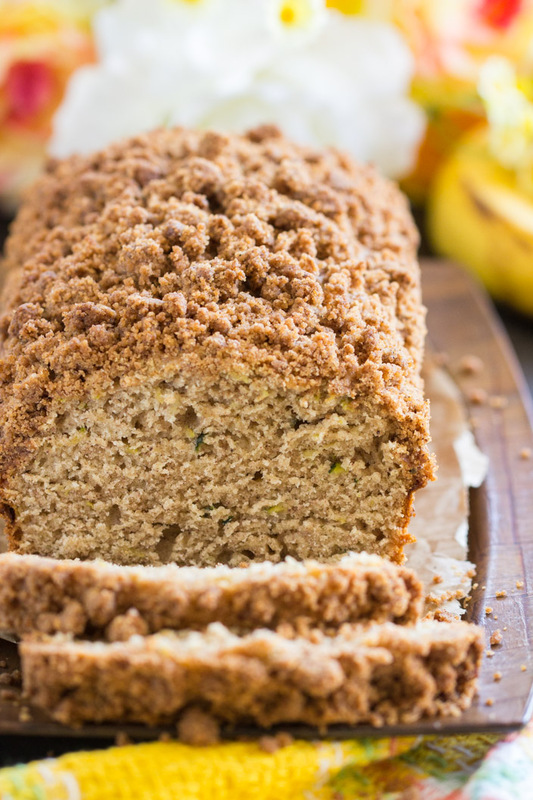 The lightly crunchy, buttery, cinnamon-spiced streusel on top gives this bread a major edge over other Zucchini Banana Bread recipes. 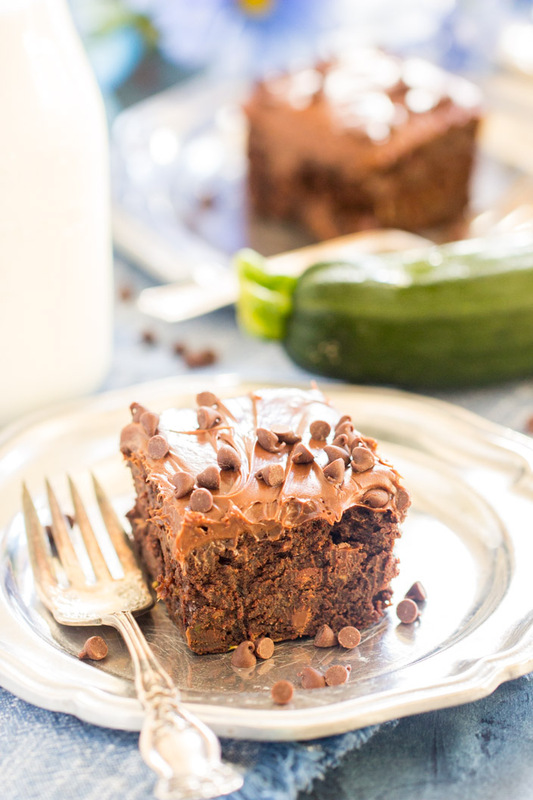 Chocolate Zucchini Coffee Cake: I really wanted to take a traditional Chocolate Zucchini Bread and flip it into a zucchini coffee cake recipe. I felt like a zucchini coffee cake needed to be a thing, and it is, plus chocolate! 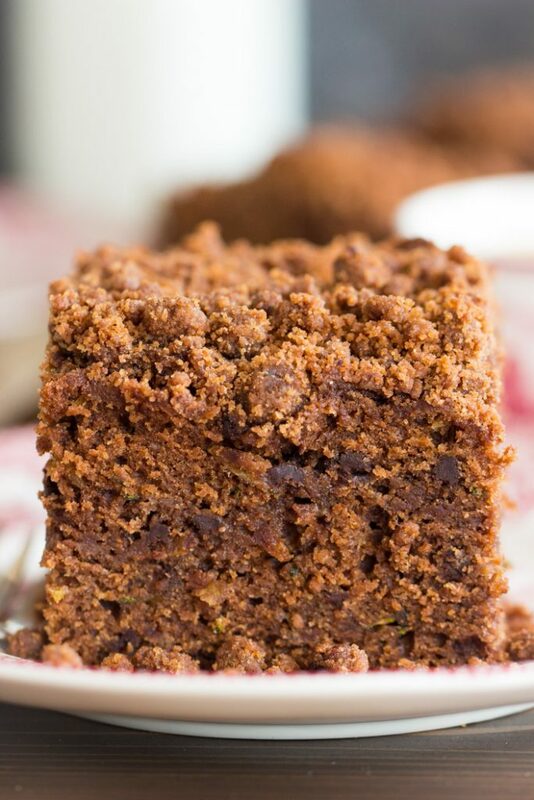 This Chocolate Zucchini Bread Coffee Cake features a buttery, sweet, chocolate streusel on top, and a thick ribbon of cocoa streusel through the center too. It’s just hard to see it because it’s alllllll chocolate from top-to-bottom. Blueberry Zucchini Bread Pancakes: You’d think that adding zucchini to pancakes might weigh them down, but that simply isn’t the case at all. These zucchini pancakes could not be fluffier! 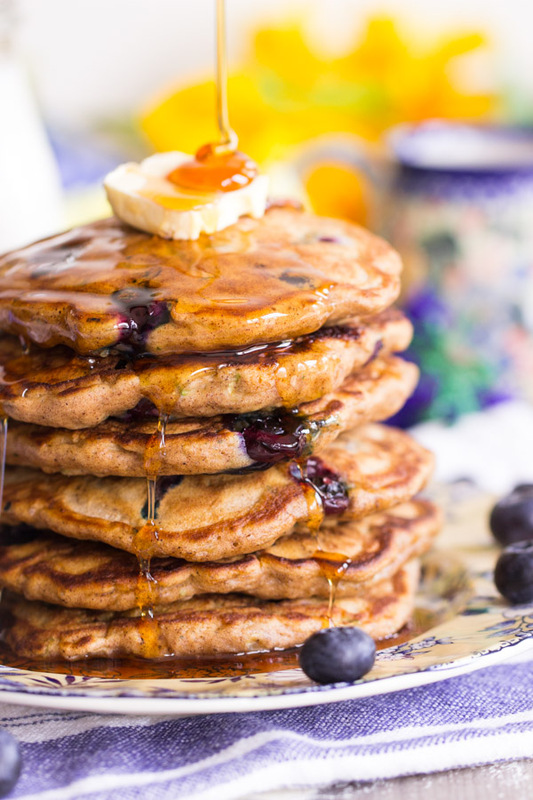 They’re so light and fluffy, a beautiful pancake, and bursting with juicy blueberries. Perfect blueberry pancakes, jazzed up with grated zucchini! 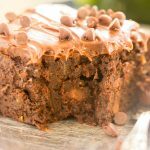 Death by Chocolate Zucchini Brownies: The best brownie recipe that I’ve found is the one that makes these Nutella Brownies with Nutella Buttercream, these Ultimate Fudgy S’mores Brownies, and a few others. They’re insanely chocolatey, fudgy, soft, thick, and just all-around over-the-top. I mean, I like box brownies, but these are hardly much more work, and 600x better. Adding zucchini changes up the texture minimally, and for the better. Oatmeal Chocolate Chip Zucchini Cookies: I love these as a brunch cookie or for dessert! These zucchini cookies are great for either scenario because they’re a bit decadent from a lot of chocolate, but they’re otherwise not too dessert-like. 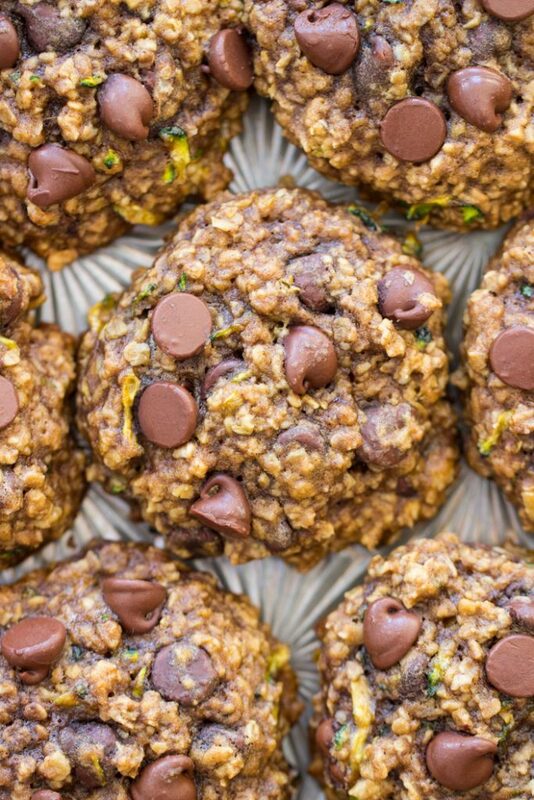 They’re basically oatmeal breakfast cookies crossed with chocolate & zucchini. Zucchini Bars with Brown Butter Frosting: These zucchini bars are kinda like a sheet cake, actually. Soft cake bars, infused with spice, and topped with one of my absolute favorite things in the world…. Brown Butter Frosting. There are few things that beat brown butter in my book, and brown butter frosting is irresistible. 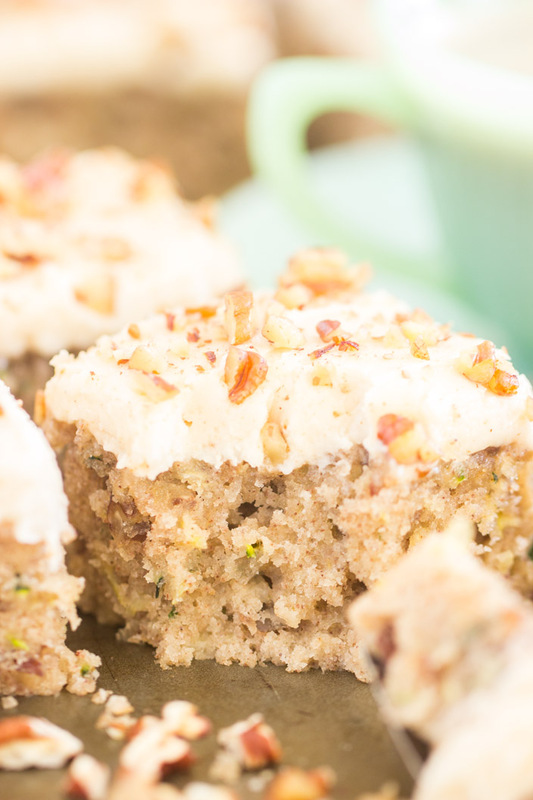 It’s a fantastic complement to the spiced cake bars, and the hint of flavor from the zucchini. 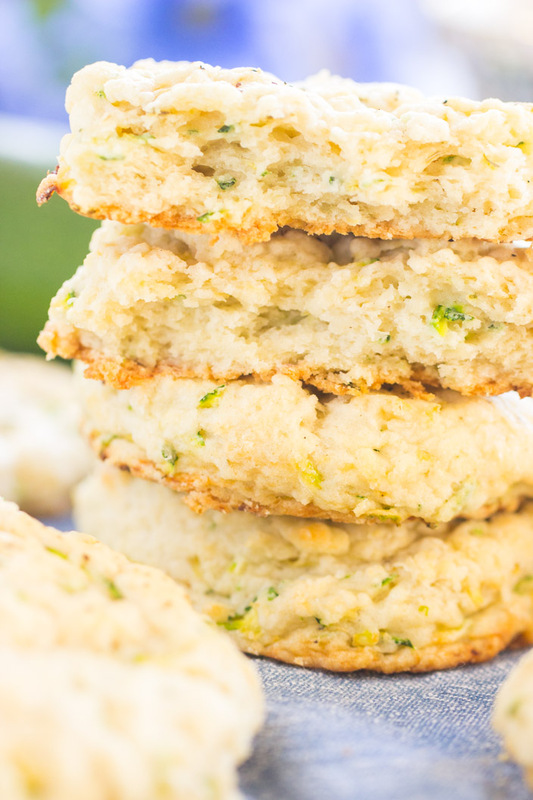 Goat Cheese Zucchini Scones: Scones are one of my favorite things to make (no secret there!). I love the gratification of having a fresh baked good, out of the oven, in about 30 minutes or less. Scones are so efficient and a good scone recipe is invaluable, IMO. 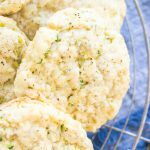 These zucchini scones are an awesome option – super moist, and the goat cheese also adds creaminess and moisture to these. A morsel of goat cheese is like gold. 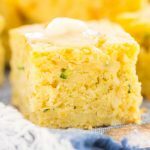 Parmesan Zucchini Cornbread: Sweet, moist cornbread is a thing to behold, and I’m a sucker for a seriously crazy moist cornbread. Dry, crumbly cornbread is just the worst, and this is 100% opposite of that. 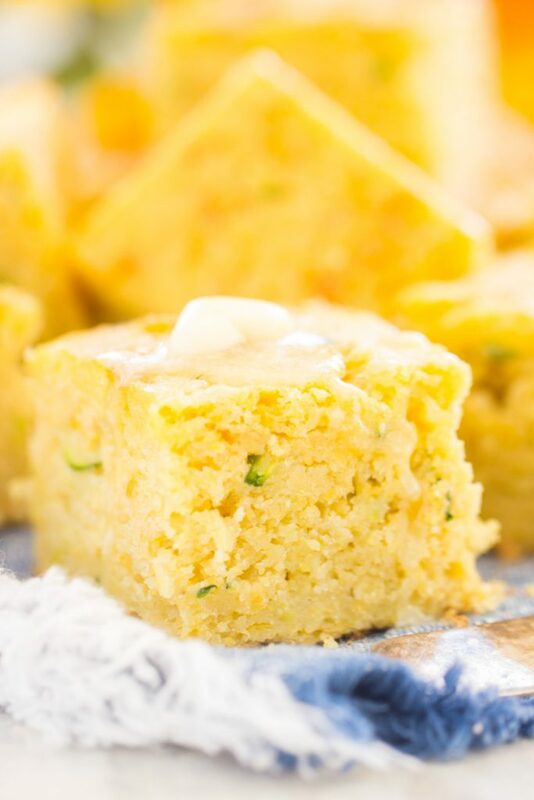 Already a moist cornbread recipe, but it benefits from a blend of Parmesan cheese and grated zucchini to give it a unique flavor profile. Zucchini cornbread is a wonderful accompaniment to a hearty salad, a bowl of soup, alongside Sunday roast or crock-pot chicken dinner. Such a gem of a recipe! There you have it! All of my current zucchini recipes in one place. What will you make from this list? What jumps out at you? 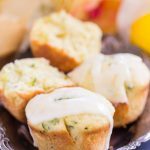 Lots of breakfast and brunch zucchini recipes – like zucchini muffins, zucchini scones, and zucchini breads, but also a few wonderful zucchini desserts. You’d be surprised how delicious a green veggie can be in a cookie or brownie, so don’t shy away from those options. In addition, a handful of savory zucchini recipes to try. I’ve got you quite covered when it comes to zucchini recipes, and I plan to add many more. If you try something, please let me know what you think. I love to incorporate your tips and feedback! Happy zucchini baking!